Film history is filled with xenophobic tales of pretty Americans who disappear in foreign lands and the pretty people tasked with finding them, and this week sees the induction into this ignominious club of what could be its worst entry. “In the Blood” is a dull piece of nonsense, a film that makes one feel bad for straight-to-DVD staples like Treat Williams, Danny Trejo, and Luis Guzman. When you reach the critical point that you consider Trejo, the star of such gems as “Zombie Hunter” and “Dead in Tombstone”, to be above this material, you know you’re in a rare category of awful. “In the Blood” is a film for which it’s hard to find something even remotely positive to say. Even the scenes that should have some sort of action-based, visceral charge are flat and inconsequential (and far too rare). It looks downright hideous, as if most of it was shot on a Go Pro. It could be used as a what-not-to-do example in an editing class; coverage feels off, the pacing is leaden, and the film develops absolutely no visual language of its own. The acting ranges from serviceable to simply dreadful, the plotting is utter nonsense, and, again, there isn’t even engaging action to make up for the silly narrative. In opening narration that sounds pulled from a YA empowerment "Hunger Games" wannabe, Ava (Gina Carano) informs us that she was told by her father to “Never cry because those tears will be used against me.” She’s tough. Get it? But she’s not too tough to get married to Derek (Cam Gigandet) and jet off on a sun-kissed honeymoon. From the very beginning, Carano and Gigandet have zero chemistry. Watching them cavort in the surf and cuddle in the sun has all the believability of a Sandals commercial and it’s just one of the first scenes that feels horrendously, almost fascinatingly off in its pacing. Ava and her new husband get into an altercation (with Danny Trejo, natch) at a nightclub and the action promised by casting the star of "Haywire" and "Fast & Furious 6" in a lead role feels like it will finally be fulfilled. And yet even this bit of fighting in a fancy dress doesn’t work. It’s shot with constant strobe lights meant to replicate the club setting, filmed from horrendous angles, and poorly choreographed. Even with that, I found myself longing for it half an hour later when the film gives up on action for its missing-man plotline. The day after the nightclub altercation, Ava and Derek go ziplining (for what feels like forever), where the new husband falls hundreds of feet, injuring himself horribly (but not enough that his cell phone stops working). An ambulance is called and Derek is shuttled off to presumed surgery and internal bleeding, but when Ava gets to the hospital, they have no idea what she’s talking about. Derek is missing. Was it the fighter from the club the night before? Someone else? A local police chief (Luis Guzman, who deserves SO much better) starts to suspect that Ava has something to do with Derek’s disappearance because, well, it’s a movie and he has to. Ava’s dad tells her in flashback that she’s “going to learn to go beyond the limit” and yet “In the Blood” is defined by its limitations. It’s not gritty enough to work as the story of a damsel in distress in a foreign land. It’s not tough enough to deliver as action escapism. It is limited in every way. Not a split second of it feels real or genuine, so one is tempted to view it as B-movie escapism, but it’s way too boring to work as that. 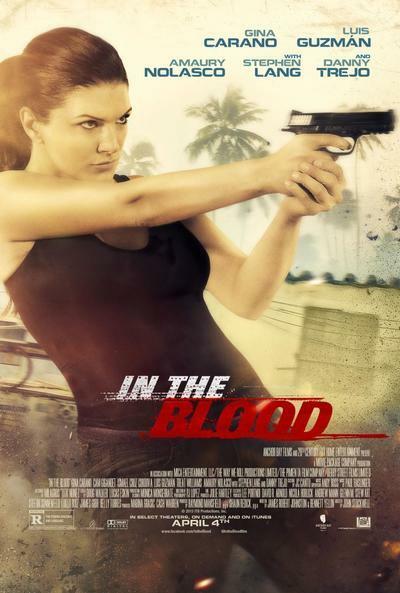 “In the Blood” never even gives Carano much of a chance to do what she does well. There’s almost no action to speak of in the “what happened to my husband” middle act. And so this physically powerful but emotionally flat performer is forced to carry a narrative about which it is literally impossible to care. Your mind will wander. You’ll start ticking off great Luis Guzman performances. You’ll wonder if certain scenes were shot on an iPhone. You’ll entirely give up on caring what happened to Derek and just hope something, anything interesting happens to Ava. And you’ll wish you were watching a better Danny Trejo movie.